Try our Uvite Tourmaline Crystals Satisfaction Guarantee - compare our prices and our superior quality. Click on any genuine uvite tourmaline image below to enlarge it. 1.1" x 0.7" x 0.6"
This specimen of uvite tourmaline crystals on calcite matrix was discovered in Bahia, Brazil. 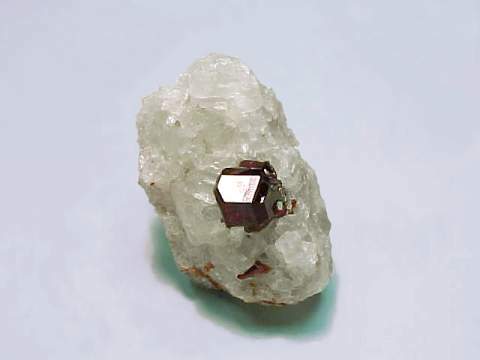 The uvite crystals have strong brownish red color, vitreous luster, and flattened trigonal prismatic form. 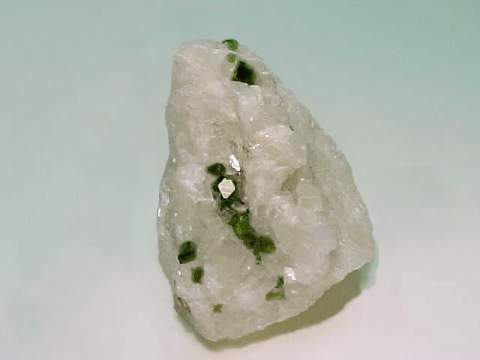 They have natural terminations in mostly very good condition, and some of the crystals are terminated on each end (known as bi-terminated or double-terminated). The largest uvite crystal measures 6.5mm in diameter. This specimen also has some small calcite crystals on its surface. The photo at left was taken under both fluorescent and incandescent light. See also a (full-view). 2.5" x 2.0" x 1.5"
This specimen of uvite tourmaline crystals on calcite matrix was discovered in Bahia, Brazil. The uvite crystals have beautiful green color, vitreous luster, and flattened trigonal prismatic form. Most have natural terminations on each end that are in very good condition (known as bi-terminated or double-terminated). The uvite crystals range in size up to about 6mm in diameter. This specimen also has some calcite crystals measuring from 7mm to 5mm long on its surface. The photo at left was taken under both fluorescent and incandescent light. See also a (full-view). This is the end of our Uvite Tourmaline Mineral Specimens virtual gallery page. See also our page displaying Black Tourmaline crystals. To see more tourmaline photos, just select another item category from the table below. To see photos of another mineral variety, select any item category link in our Mineral Inventory & Factsheet Index. Would you like us to inform you when we add on this page more natural Uvite Tourmaline crystals and mineral specimens? We do have additional inventory of natural Uvite Tourmaline mineral specimens in stock, so be sure to let us know if you have any genuine Uvite Tourmaline mineral specimen requests. Please contact our webmaster or our 'site' geologist with any questions or comments.